Whatever the season, there is never a shortage of wheeled coolers to choose from. 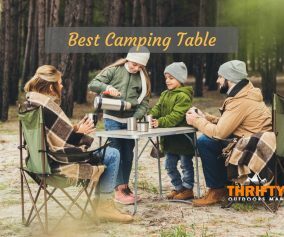 The best cooler on wheels are the ones that make your camping or hiking life easier by keeping important beverages and food ingredients from spoiling, while lessening the burden of transport over long distances. Yet, with a bunch of options wherever you go, you might find yourself wondering what wheeled cooler is truly best for you and your needs. That is why we decided to come up with guide—to save you time and sanity by helping you understand what makes a wheeled cooler go from good to great. 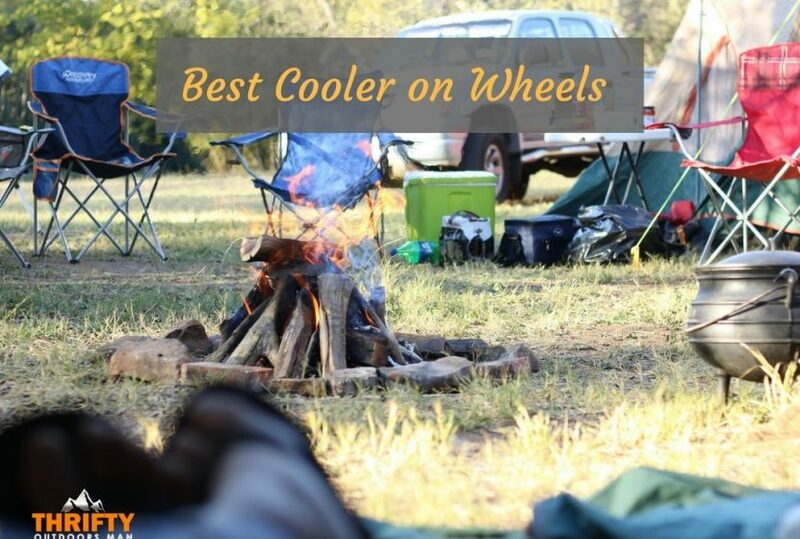 This list has a cooler for everyone, as well as some tips for picking the best wheeled cooler. Another Igloo product? We can’t deny the balance of quality and affordable price. Simply put, Igloo coolers are some of the best on the market, no matter what size you are hoping to obtain. Case in point, the tiny personal wheeled cooler called Island Breeze, which practically hums “Margaritaville” also it rolls over both asphalt, packed sea, and other kinds of turf. The push-button, telescoping handle is long enough to support taller users. Molded side scoop handles also make it easy to lift and handle when rolling is out of the question. When you need maximum capacity (110 quarts), and the most bang for your buck, look no further than Igloo (again). Not only does the Igloo Glide Marine Ultra have a svelte line and superb durability, it features oversized rally wheels to offer smooth rolling and control while moving over any number of surfaces. The thick Ultratherm foam in the lid will keep ice for up to 6 days. This is due to UV inhibitors and infrared technology built into the insulation. Another plus about this Igloo model would be the handle. 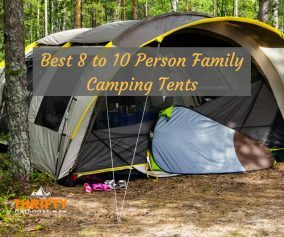 Though it might be a little short for some users, the construction makes it rust-proof, and the cushioned grip is comfortable enough for longer hauls. For anglers, this rolling cooler also has an integrated measuring tool on the lid. When you seriously want the best cooler on wheels, you choose an elite cooler that was the designed with the serious camper or sportsperson in mind. The Pelican ProGear Elite Wheeled Cooler with 45 ot 80 quart capacity has dozens of unique features that make it worth every cent. First, this cooler can keep items cold for up to 10 days, thanks to the freeze grade gasket and thick polyurethane insulation. Other notable features would be the integrated fish scale on the lid (ideal for fishing and weighing out ingredients), heavy duty, all-terrain wheels, and a built-in bottle opener. The reinforced corners also make it perfect for more intense outings. The design was even award the bear resistant certification from the Interagency Grizzly Bear Committee. With 70 quarts capacity, the Igloo Ice Cube Maxcold might not be the maximum in size, but it is certainly one of the most convenient. The biggest benefit of this cooler would be the telescoping handle, which allows you to easily move upright, no hunching required. Also, the cooler has molded side handles. Reinforced and durable, you never have to worry about handles breaking off or ripping. And if you plan on partying for the long haul, this cooler is so well insulated that it takes 5 days for ice to start melting. 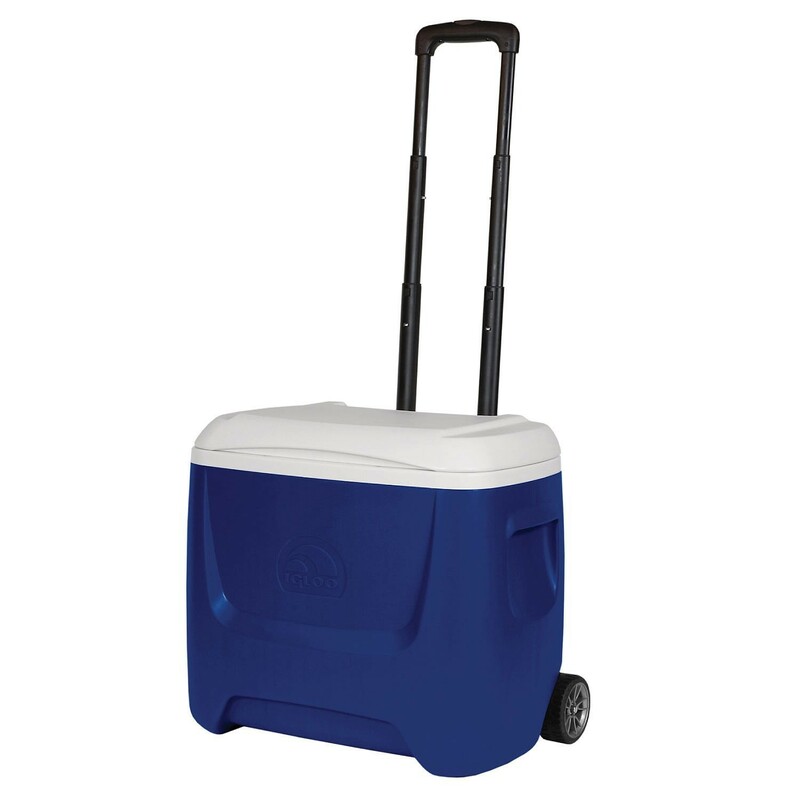 The fact that the Travel5.0 rolling cooler has “beach” in the name should be an obvious sign that this wheeled cooler does extremely well in various terrain. Though the wheels are tiny, they are rubber “skate” wheels that can handle even uneven surfaces. You can also depend on the cooler to take abuse well, considering that it is made of ripstop nylon and 1680D polyester. There are several compartments to help you carry perishable goods and liquids without compromising anything. Coleman certainly knows how to live up to expectations. People with large families or an affinity for bustling social gatherings will love the convenience of the Coleman 50 Quart Xtreme 5-Wheeled Cooler. 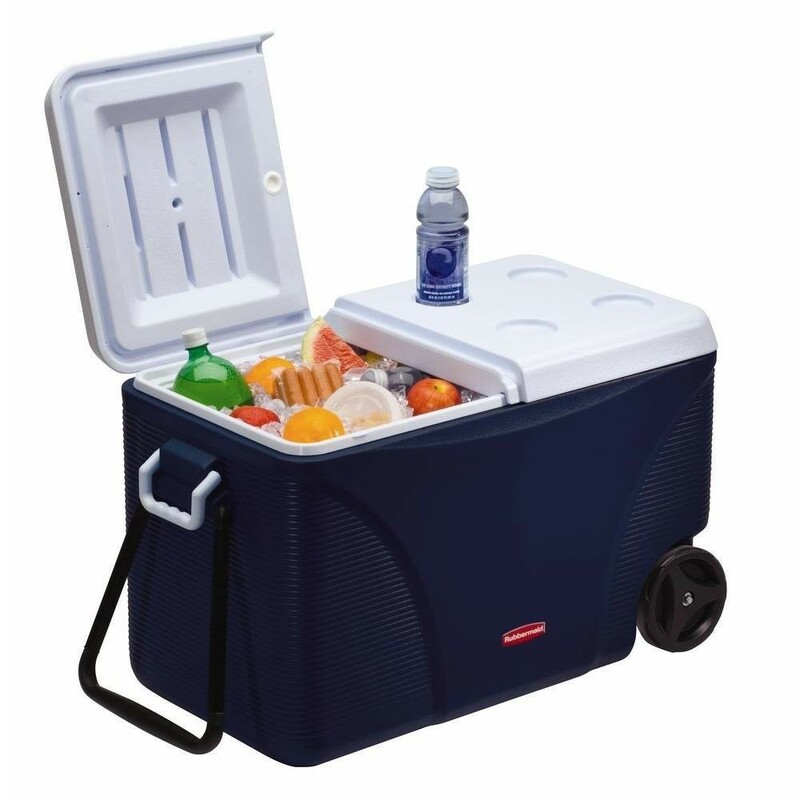 This cooler comes with a number of features that truly take it to extreme levels of awesome, such as the four molded cup holders in the lid or the fact that said lid can support up to 250 pounds without buckling. Need a seat or a quick boost? No a problem with this Coleman cooler. Other enticing features include the telescoping handle and all-terrain wheels. There is no where this cooler can’t go. Note: There is also the Coleman 100 Quart Xtreme 5-Wheeled Cooler for those who need a bigger model without losing the features. Yes, the same Rubbermaid that is a star of the kitchen is also a camping pro when it comes to DuraChill rolling coolers. The unique take on wheeled coolers is probably one of the most budget friendly on this list, especially when you consider the range in capacities (45 to 75 quarts) and design. While the cooler is on the bulky side, if you can overlook that, you can enjoy the added stability and balance gained while pulling. The split-top opening is also highly convenient, allowing you to sort goods. Plus, this Rubbermaid cooler has superior insulation technology that keeps food and drink fresh for days. Sometimes you don’t want an unwieldy wheeled cooler to have to lug around, especially when it’s just you and some friends that will be using it. Enter the Coleman 42-Can Soft Cooler with a removable hard plastic liner, heat-welded seams, and built-in handles. Not only is the cooler resistant to leaks, it is a cinch to load up and clean. The exterior lid has a couple of bungee fasteners to hold some items secure, while the front compartment allows for other bagged snacks or necessities. 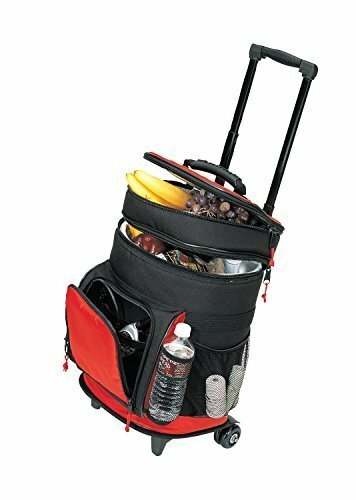 At 6.3 pounds, the Coleman 42-Can Wheeled Cooler is also one of the lighter options on this list. Think about it. A taller person who chooses a cooler with a handle fit more for a child is going to have a difficult time handling their cooler, whether it is on wheels or not. If you plan on rolling the cooler for an extended period of time, you want to consider a cooler that has a telescoping handle so you don’t tweak your back. There are two reasons why considering capacity is important. First, the more you can fit inside means the overall bulk of the wheeled cooler increases. Handles and wheels attached the cooler will make the case seem even more cumbersome. If you plan on traveling, you want to pay attention to the dimensions of the cooler. 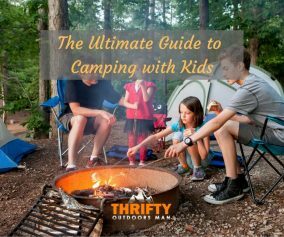 While the main focus should be whether or not the cooler is going to keep your goods, well, cool, there are a couple of features that make camping and hiking less hectic. For example, some of the more higher end models will have built in bottle openers, which is great for people who forget to pack their own bottle opener. Other coolers are adept at keeping ice much longer than cheaper models. Obviously, the higher your budget, the more of these unique features you can afford. There you have it—8 of the best cooler on wheels available right now to purchase. Which one appeals most to you? While choosing a cooler with wheels isn’t necessarily hard, but depending on your needs, the one you select might be different than someone else’s choice. Ask yourself how many people the cooler is going to have to serve, what terrain you will be carting it over, and how long the ice needs to remain frozen. 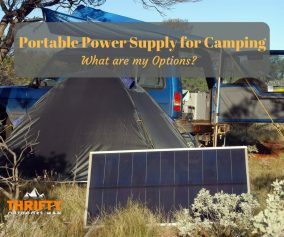 Once you answer these questions, you will be able to find a cooler on the provided list that is best for your needs. Jetboil Zip vs Flash: Which one is right for you?